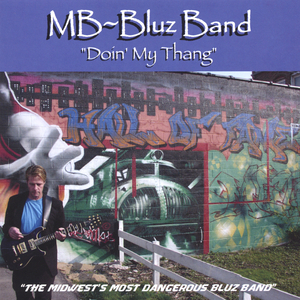 Mark and company drive the blues hard to crowds everywhere and now you can taste the flavor of Rockin'Blues, Funky Blues, Guitar Blues,Electric Blues that MB~Bluz Band throws down. Mark Blake (a.k.a. MB~Bluz) started playing guitar as a teen in Central Ohio and fell instantly in love. His first band had been an 80's hard rock band covering everything from Heart, Pat Benatar to ZZ Top, Scorpions, Rick Derringer and MSG. Brother Matt held the bass position. They fought the rock band's fight long enough to record an album, only to have tours and gigs constantly cancelled by member changes. At this time he knew he would have to front a band to play at the caliber he wanted to play. Growing into new styles, the Blake Bros. Blues Band was born. Handling front spot Mark's blues voice emerged, raw and powerful, to mirror his guitar style. Albert Collins, Freddy King, B.B. King, Mark May, Larry McCray and Gary Moore all had a major part in his style. After moving to Cedar Rapids, Ia and playing solo for 3 years and recording a killer CD entitled "Ready to Go", The MB~Bluz Band emerged. A wicked 3 piece band of veterans from jazz, soul, funk and the blues. This was the combo Mark had dream of for 20 years!!! Well rounded and ready to party! MB~Bluz Band is enjoying love and respect from blues clubs and festivals as well as radio airplay in MO, and Kansas and Iowa. With the next project to break national they are forging a name in the bluz! "The Midwest's Most Dangerous Bluz Band!"